For you all, I have created this 12 months of pics of my little man. He is due to go into his new room soon as we have number two on the way at the end of the year. He will be a little young than most (17 months) but we are hoping for a smooth transition to a low toddler bed that my husband and I are currently designing to match in with the linen set that I have purchased for his room. His room will be all about monkeys (his favourite animal at the moment), and so I thought it would be nice to have something already made to go up in his room. They just grow so quick, so I dug out this Twiddleybitz 'Days to remember' calendar which comes complete with the words that I decided not to use as I wasn't creating a calendar. Although it was very time consuming to make, it is well worth it when you get to the end and see all those smiling faces looking back at you. 1. 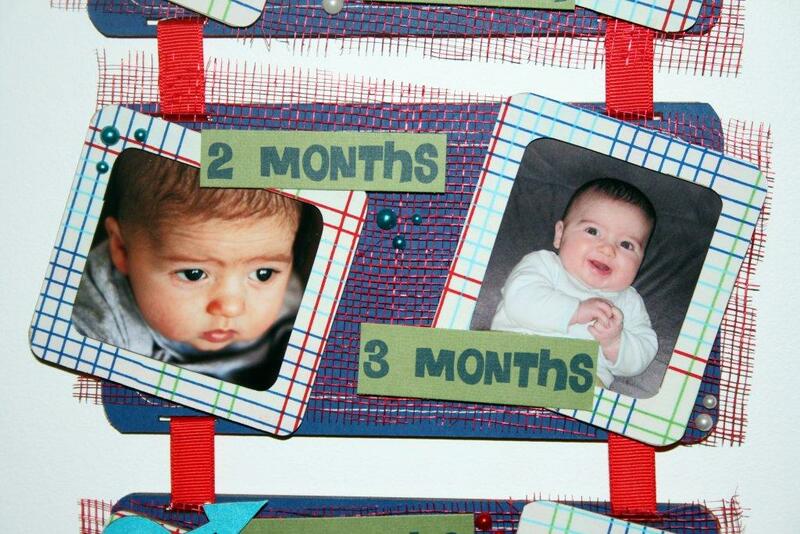 The first job was to cut the blue cardstock to fit each of the wooden pieces. I was only doing one side and therefore only needed 6 + one for the title. I then stiched with white cotton around the edge with a twin needle (this does the 2 lines at once) on the sewing machine. These were all then stuck to the wooden pieces and the slots cut out with my craft knife once dry. 2. The next job was to thread the ribbon. When I threaded it I used a file to space it and then stuck the ribbon to each wooden piece with some double sided tape. This keeps all the wooded pieces even when it is hung. 3. I then cut up the red netting to stick down, and adhered with Helmar 450 glue which is my favourite for making things stick that take a little more effort to stay down. It is also fantastic with ribbon as it doesn't bleed through and show up when dry - even on organza! 4. I then covered all the frames with paper and stuck my photos of choice behind them. These were then adhered to the wooden pieces with some foam tape. 5. The heart swizzle stick has the heart cut off to create a plain wave. I then painted the twiddleybitz arrows, star and the wave with white paint before stamping the light blue on them, to bring out the blue more. You need to wait for the paint to dry before stamping, but it gives a much better base for your chosen colour if it is a bright one. 6. I then embellished the photo hanger with the arrows, titles for the months, some pearls and a title for the top. I hope you have enjoyed my share, and remember - just because a particular off the page product has a purpose, it doesn't mean it can't be adapted for something different. I can't let you go without knowing that there will be a giveaway on my blog as well. I will be sending off a lovely pack of assorted goodies, OF COURSE including some yummy twiddleybitz. To be in the running, you have to have a mailing address in Australia, leave a comment here on my blog and also 'follow' my blog. If you have successfully done this by midnight Monday the 9th August, you will be in the running for this lovely prize. OK, so the blog hop is still going with one more post to come. The lovely and always inspiring Tiff Sawyer our co-ordinator is the next to share, so make sure you keep following as her post will be up at 8pm tonight. I would also like to take an opportunity to thank Tiff for organising such wonderful fun for us all to enjoy over this weekend... it has been a BLAST!! 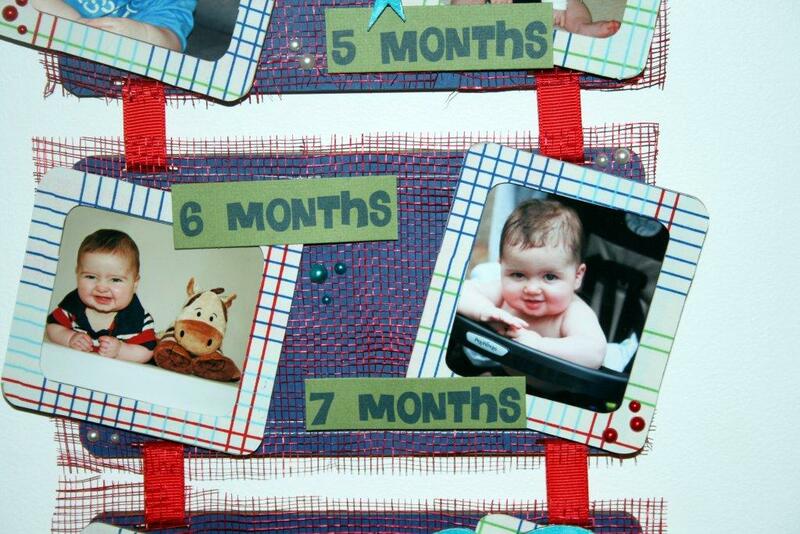 What a wonderful keepsake and record of your gorgeous little boy. Thanks for sharing it with us and how you made it. I love seeing how much children have grown and changed, just beautiful! That is so cool Bec, love seeing all those smiley faces! Love how you used the twin needle in your machine, and the red mesh too - looks fab! Oh thats so CUTE.You are so clever!! 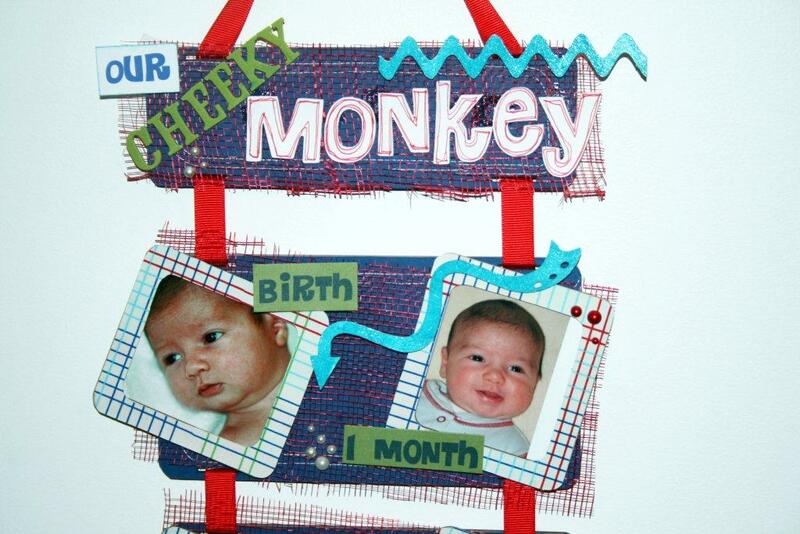 I love this wall hanging and am inspired to do one for each of my boys! Thanks for sharing. I love your wedding pages too. Shame I don't have an Asuie addy to be in to win but never mind I will be a follower of your blog any how! What a great idea Bec - love to see projects that are outside of the box. Great use of the calender and a great tutorial! Hope you are feeling better soon - remember to look after yourself! Oh what a gorgeous idea and what a cute little man you have :-) I think it will look smashing in his room!! All the best for a smooth transition to his toodler bed and also for the new arrival :-) How exciting!!! This is such a gorgeous idea!!! It looks fantastic and is something you will treasure forever. Thanks so much for sharing! 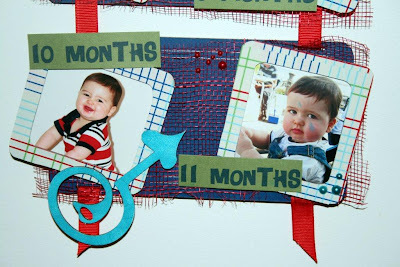 what a truly beautiful reminder of the first twelve months and how fast they change and he is a very handsome and kissable baby boy too. i'm sure he will find his new big boy room truly special with such a talented mum to make it so. Wow Bec, what a load of work in your growing tags...it is simply tremendous!! How lovely to have hanging on the wall....amazing what you gals can do!! Been lovely hopping around & seeing such inspirational work. goodness me Im the first...whoohoo! 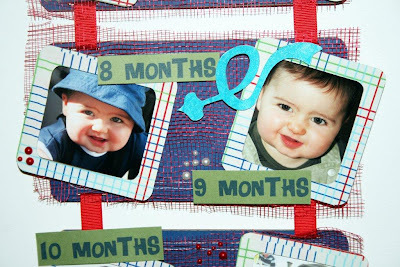 love this, what a great idea for your little one. these are memories to treasure, as they grow up way too quickly. thanks for sharing with us hoppers. lovely lovely lovely. all those gorgeous eyes looking at you. a treasure forever. What a gorgeous project - well worth the many hours you must have spent on it. I just wanna pinch those cheeks of your beautiful young man! 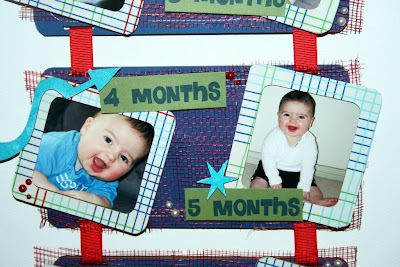 What a FANTASTIC way to showcase your childs first year! And you are so right...Twiddleybitz is so adaptable...you are only limited by your imagination!!! Gorgeous baby picks too and great tutorial!!! What a gorgeous wall hanging!! I love the progression of photos of your gorgeous little man. I hope his transition into his new room goes smoothly. I've lovely having a lookee around the rest of your blog too - you've got a lovely scrapping style. And your cake making's something else too!! Soooo cute, what a wonderful way of documenting a year of life. Congrats on the pregnancy and goodluck with two little ones under two!!!! Piękny kalendarz, super pomysł. Pozdrowienia z Polski(sehr schon das Almanach, das gute Idee. Grusse aus Polen). 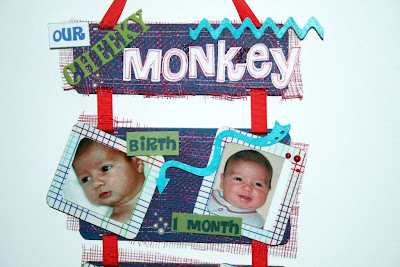 That is such a cute idea, your little monkey is adorable! That's a great way to record monthly progress!!! Hi! That is so cute! I love it! How great! I love it! he looks adorable! what a fabulous keepsake! love the colours you have used too! What a cute little monkey you have :) thanks for sharing. Gorgeous, such a precious keepsake. Loved the tutorial.